What is Fire Factor? Describe the practical application of this Factor in Forestry? Provision & maintenance of Equipment. § The fire has always been an important factor in the territorial environment. 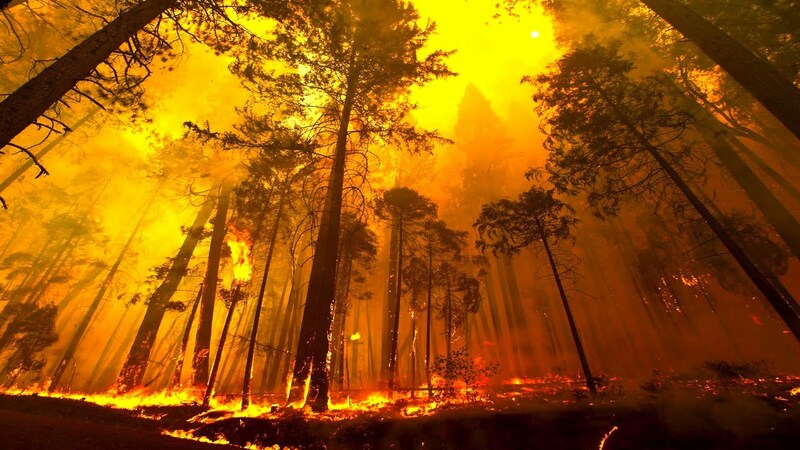 § Vegetation has been ravaged periodically by fires since its earliest appearance on Earth. § Such fires were probably always started by lightning. § With the speed of civilization man-caused fires have become far more numerous. i. Live cinders from nearby hearths, Rail engines or Tourists cooking place. § This fire kills almost all small vegetation and big trees with thick bark survive. § The creeping or ground fire destroys grasses, leaf litters, stumps; logging wastes, wind-fallen trees etc. in its way. § It advances with low speed. § The ground fire occurs where the top layer of soil contains semi-decayed vegetation. § The fire hardly contains flames but is marked by constant black smoldering fire. § The creeping or ground fire is difficult to extinguish because exact position of fire is difficult to locate. § Even after the fire has been apparently extinguished the ground fire may strike again unexpectedly. § The ground fire occurs both in deciduous and coniferous forests where partially decomposed leaf litters or needles are present. § It is more intense as compared to the creeping fire because the availability of fuel is more. § The fire destroys whatever comes in its way. § Majority of the forest fire are surface fires. § It advances rapidly and even destroys shrubs, seedlings, and saplings. § The ground fire has the capacity to do a lot of damage when the wind is also blowing fast. § Young plantations up to 10 years of age can be wiped out older plantation are badly scorched. § The majority of fires are surface fires that burn mostly leftover material and leaf litter on the forest floor. § Surface fires are easy to control if tackled in a right way and at the right time. It occurs mostly in chir pine forests. § Every small forest fire can become a big fire if the combination of dry weather and high winds occur. § Surface fire do a lot of damage to young conifers whereas broad-leaved species have greater power of recovery. Even the seedlings and large trees are damaged considerably. § The crown fire is deadly and occur mostly in combination with surface fire. § The crown fire starts initially as surface fire but due to strong winds develop into crown fire and leaps from one tree to another. § These fires due to high-temperature jump by sparks as heat travels by way of Radiation. § The ignition takes place because strong heat radiation materials are not necessary. § The crown fires mostly occur mostly in coniferous forests. § Low crown fire destroys lower branches of big trees where small trees are completely destroyed. § High crown fire destroys everything on its way. § The high temperature of forest fire destroys many seeds. § Accordingly forest succession is changed and regeneration of species can be seen after the forest fire. § Forest Reduces content of organic matter in the soil. § It also affects the nitrogen content, cation exchange capacity, exchangeable calcium and magnesium, availability of phosphorous and potassium. § It also reduces water holding capacity of soil and increases soil erosion by breaking large stable aggregation. § The losses to Timber and property are apparent. § The loss due to the killing of seedlings which would provide future Timber crops cannot be measured. After a fire, a much shrubby growth of many species is observed. § The area becomes degraded and repeated fires turn the good forest land into an unproductive wasteland. § The standing trees, damaged by forest fires become prone to wood Rot. § Fire weakens trees are quickly attacked by pathogens and insects which in future are likely to be filled by the wind. § The forest flour is unable to use accumulated water and surface Runoff carries away a huge quantity of fertile soils. § Many animals and birds fall prey to fire. § The wood ashes accumulated in rivers and ponds kill many fish and aquatic life. 1. Prescribed fire can achieve certain management objectives. 2. Controlled burning is important in forest and wildlife management. 3. The fires are necessary to maintain Fire lines which check the spread of Forest Fires. 4. The controlled fire or burning improves the site, enhances germination by exposing the mineral soil and reduces weed competition for future seedlings. 5. They also eliminate many fungi diseases. 6. In poorly stocked forests the forest fires enhance regeneration of grasses which are useful to domestic as well as to certain wild animals. 1. In mountains and high altitude areas. (h) Keeping animals away from dwellings. (i) The discarded but of burning cigarettes, bidis by smokers. (j) The camping parties before leaving the forests must ensure that no sparks in left behind. 3. The incendiary fires are the fires caused by a man with malafide intention. 4. The accidental fires may be caused by air crash etc. or such fires may occur due to the slash burning in the neighboring fields. § The high temperature, low humidity and high and strong dry winds are the factors responsible for most of the fire. § The peak fire season is normally from March to mid-June in most of the country. § The quantity and nature of fuel or inflammable material are deciding factors for the occurrence of fire. § A fire in open grassland will travel much faster than in a densely crowned plantation. § The more the inflammable material more difficult is to extinguish the fire. § The area covered with a slash, debris and large accumulation of dry fuel is always a menace to the neighboring trees. The fire severity depends directly on the availability of fuel. § The head of fire is towards the direction of the wind. The wind velocity is responsible for drying the fuel ahead of the fire. § If the terrain is undulating and rugged the fire spreading is irregular in shape. § The fire easily goes up the slopes. The slopes which are exposed to sunburn with more severity. § The hot air current rises and may spread the fire a few hundred feet ahead of it. They are called SPOT FIRES. § The conifer needles take fire very easily as compared to hardwood litter. The conifer cones are much flammable. § When the grasses and other herbaceous vegetation becomes dry they easily catch fire. § Must of the fires are man-made and fire prevention programme, therefore, should include the Education of people. § The trained staff should keep the MAP of the Forest area and equipment for firefighting. i. Good silvicultural practices including weeding, cleaning, removal of dead and dying trees climbers cutting, thinning etc. So that fuel is not available to the spreading fire. ii. Selection of fire-resistant species and avoiding pure stands. iii. Controlled and planned grazing to check the ability of undergrowth from catching and spreading fires. iv. Controlled burning to keep inflammable material at a low level. The controlled burning should be carried out in humid conditions at the suitable time and when the wind is not blowing. v. Use of herbicides such as 2,4-D, 2,4,5-t.
vi. Cleaning and maintenance of fire breaks and roads. Fire lines are cleared strips of sufficient width made all around the plantation and running criss-cross inside plantation so that compact block OR area is separated from the other area. Fireline should be cleared start of fire season. Similarly, fire breaks should be maintained to prove fuel free barrier to fire. Fireline can be aligned inside as well as outside the boundary of the plantation. The compartment lines, Roads, water channels etc. also serve as fire lines, therefore, needs to be maintained in good condition. vii. Planting of evergreen species as firebreaks. e.g. viii. Creation of watchtowers and deployment of fire watchers for 24 hours to watch the most extensive view. ix. The smoke sun within or near the forest are should not be ignored as it may be the beginning of a big devastating fire. i. By eliminating heat to use water or mineral soil. ii. By beating with the Broom made of elastic green branches and twigs available at the spot. Spads, Sing beat Axe, Brush looks, Fire brooms, Hand Saws, Wireless set, Vehicle, maps, Long Handle Shovels. v. Fire Danger Notices: Notices Displayed at suitable points mentioning the punishment to the offenders & Rewards for reporting and helping in extinguishing the fire. “Fire control in Margalla Hill Forests Islamabad” Thesis by Khalid Mehmood Bhatti. 1977. § Forest fire which is deliberately set to cause damage with a malice against the administration of C.D.A. carried by a person who has been either drafted from some forest offense previously, or those who could not gain employment in the local forest. § Deliberate fires are also started by a person who wants to have lush green grass for the cattle in the coming season. § Sometimes the fire is set by local people to scare the wild animals. Such fires are common near populated villages. § Accidental fires are started generally by throwing butts of cigarettes or other burning materials by careless passerby or visitors for Recreational purposes. § Fire is also caused by labor or visitors who do cooking in the Forest at places where it can spread easily. § Sometimes children set to fire only for fun sake. Accidental fires are thus common along the through fares or near picnic spots. Very infrequently a fire may start by lightning or other unclassed causes. § It can be said that peak period is between May and June and peak time of fire occurrence 1400 to 1800 hours of the day. § 80% fires took 3 hours/Acre to control. 1. Incendiary fires caused by graziers and workers traveling through the hills in the morning in connection with their jobs in Islamabad. 2. Incendiary fires started by villagers and graziers out of malice or to get good grass. 3. The occurrence of litter in the protected area of scrub vegetation. 4. Accentuation of fires hazard in hot dry season. 3. Low humidity in the air. SEE ALSO: Discuss determination of plan objective and formulation of plans and projects. 1. A vast amount of Regeneration is destroyed in the fire but much of the Natural Regeneration comes up as Result of the burning of the Forests. 2. Fir is inimical to existing Regeneration but is good for inducing Regeneration. 3. In the coniferous Forests, the fire is very harmful as the important species are fire tender but the burning of the layers of un-decomposed needles may provide a good seedbed. In such situation, Blue pone (Kail) is favored due to its more seeding ability. In chir pine Forests larger trees are not damaged by Fire unless resin executions catch fire or much slash is present. 4. Fire consumes needle layers and grasses but increases soil erosion. 5. It is better to burn the Forests before seed fall to get good Regeneration but this Regeneration may be destroyed by the fire in the following year’s precaution must be taken. 6. The uphill forest is more destructive than downhill fire and therefore should be suppressed immediately. 7. In chir Forests, fire is not allowed in seeding felled areas till the Regeneration attains a height of 1.5 meters on cooler aspect and 2 meters on hotter aspect. To avoid this a 30-meter wide belt along compartment line surrounding the area is annually burnt to check accidental fires from adjoining areas. 8. The controlled Burning at an interval of 2 – 3 years should be carried out in areas where the seedlings have attained a height of 4.5 meters in cooler aspect or 2 meters in hotter aspect. 9. To avoid damage due to burning, the area should be opened to grazing before burning. 10. Control burning is the chief weapon to protect the young Regeneration form summer fires which are mainly responsible for impeding the establishment of Regeneration. 11. The crop should be cleaned first and cut material should be collected in blanks or Nullahs where it should be burnt. 12. Around patches or Regeneration below 4′ in height, fire tracks 2′–3′ brushwood before starting the fire. 13. The burning will be done by dividing the whole compartment into strips of about 100′ to 150′ width, depending upon the slope of the ground. 14. Each strip should be surrounded by a fire track 4′ wide from which all inflammable material should be removed. 15. The watermen equipped with brushwood brooms should stand along the topmost track and fire started from it to go downhill. As soon as this strip is burnt, the next below it should be taken up likewise. 16. To stop burning Resinous cones rolling down, small ditches may be dug along fire tracks to catch them. 17. Before firing the strip, it should be advisable to burn the area surrounding the fire tracks cut around patches or un-established Regeneration. 18. The optimum time for burning the forest under control is immediately after the first shower of winter Rains which normally comes late December or early in January. While Regeneration less than 10′ high should be Regularly burnt every year, compact patches or advance growth above this limit need not be departmentally burnt, as constant firing causes, Retrogression in the factors of the locality; desiccation sets in and the soil deteriorates. 1. Fire danger forecasters including meteorological data collection equipment. 2. Detection equipment including Binoculars, Alidad, Compass. 3. Communication System, Wireless, Telephone, M. Oil. 4. Tools and implements to use for the construction & maintenance of fire breaks. 5. Suppression equipment e.g. Water bottles, Emergency food, Helmets, Fire-proof gloves, Long boots, Pick-axes, Shovels, Pulaski, Tavern, Racks, etc. i. Water alone or water mixed with Retardants.